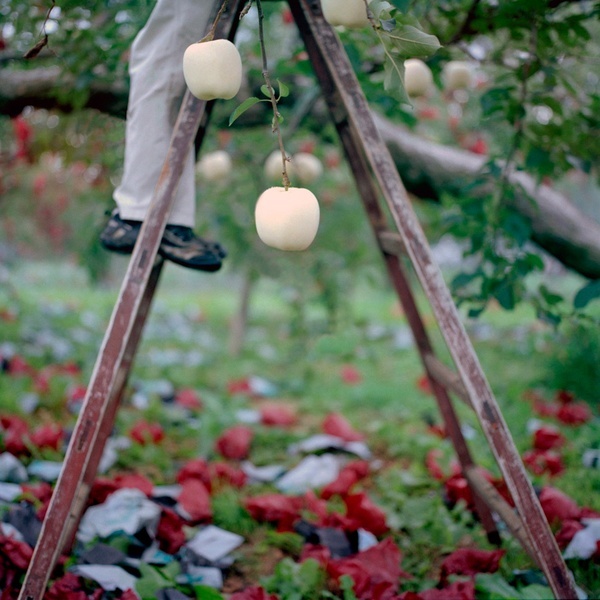 Jane Alden Stevens' Seeking Perfection: Traditional Apple Growing in Japan portfolio documents a specialized form of apple cultivation in the Aomori Prefecture in Japan. The series is stunning in its delicate visual beauty as well as the meticulous farming practices it captures. A tremendous amount of care is put into the production of a single perfect apple. According to Stevens, from blossom to harvest, each apple is touched by human hands at least ten times -- from culling unwanted blossoms, to hand pollination, through bagging apples as they grow, further culling and for some apples, the application of stencils on their skin. It is a painstaking process that results in large, exceptionally delicious and beautiful apples that cost about $10 each and are often presented as gifts. It's a tradition of cultivation that is slowly dying out as farm workers become harder to come by. Sarah Bradley: How did you first encounter the apple orchards of the Aomori Prefecture? Can you tell us about your experience of photographing this series? Did you interact much with the farmers and how did they react to your interest? Jane Alden Stevens: I first became aware of this method of raising apples by reading a short article about it in the New York Times. I couldn’t imagine what acres of trees filled with colored paper bags would look like and it quickly became a “must do” project for me. Because I don’t know Japanese and because I was shooting in a very rural environment, I used grant money to hire a driver/translator for each trip I made. This made things infinitely easier. While there, I interviewed apple scientists, bag makers, and apple-cooperative leaders as well as the farmers themselves. I went to over 100 apple farms, some large, some small, over the course of the two years I was shooting, and revisited some of them two or three times. One of the farmers gifted me with two bottles of apple juice made at his farm. They were labeled with a picture he had taken of me while I was shooting in his orchard. The farmers couldn’t have been nicer, but most of them couldn’t understand why I wanted to photograph apple trees instead of cherry trees, as most people do. SB: You used a variety of medium format cameras to shoot this project, including a Pinoramic 120 handmade by Kurt Mottweiler. Can you talk about using these cameras and why you selected them for this series? JAS: On the first trip I made to Japan, I wasn’t completely sure what kind of camera would be best suited to the project, so I brought 5 different kinds with me. It quickly became clear that the Pinoramic 120, the Hasselblad and the Noblex Pro 6/150U cameras were giving me what I was looking for in terms of depth-of-field, scope of the scene, and how close I wanted to get for certain shots. I had used all of them before and was well acquainted with their capabilities. SB: You state that your work nearly always engages notions of history and human intervention -- Seeking Perfection being a prime example of both. Can you talk about how these interests guide your photographic work, particularly with this series? JAS: Upon my first visit to Aomori Prefecture, I quickly realized that bagging was disappearing as a method for raising apples because it is so labor-intensive. “There are not enough hands” was a phrase I heard from many farmers when asked if they were bagging as much as they had in the past, and if they would continue to do so into the future. Although bagging apples probably won’t completely disappear, it is obvious that a big shift is occurring in this regard. Shooting this project became a way to preserve the memory of this agricultural tradition as well as to speak to the issue of human intervention in the land. Interestingly, this project has stimulated a deeper interest in how human activity remains visible in the landscape long after the activity has ceased. I am currently working on a new series of pictures that grew directly out of what I shot for Seeking Perfection. SB: You have a wonderful statement on your website that details a beautiful day on the beach, complete with the sensual details of the wind and smell of the air, a day when you picked up your camera to take a photograph, but put it back down. The statement speaks to the limits of what photography can capture, and you say that the experience influenced what and how you photograph. Can you elaborate on this? JAS: Photographs simply cannot replicate reality, so I no longer try to achieve that, as I did when I was much younger. When I find myself in a setting that is powerful in some way -- be it peaceful, terrifying, beautiful, chaotic, etc. -- I would rather experience it without a camera being a part of it. The camera puts a filter between me and the experience of being there. By this I mean that the act of photographing diverts my attention somewhat from what is in front of me and around me. I no longer feel fully present. If, on the other hand, I have gone to that location specifically to shoot, I will spend as much time as possible simply being there and taking it in for as long as I can before reaching for my camera. In terms of what I photograph, I tend to shoot with intention. This means that I have a pretty clear idea of what I want to express and then go out and look for ways to create that visually. I much prefer this approach than shooting spontaneously. SB: You are a Professor of Fine Arts at the University of Cincinnati -- how does your work as a teacher interact with your personal photographic practice? JAS: In our program, we aim to provide our students with solid intellectual work and study that joins the past to the present. I do this by bringing the research methods, working technologies, and results of my photographic investigations back to the classroom. I also find that discussions with students about these issues stimulate my creative juices in a way that doesn’t happen with anyone else. It’s exciting to have students who ask challenging questions about my work as well as their own. Since I retired a few months ago, I will keep working with student assistants in order to keep that kind of stimulation alive. For more information or to purchase a print please contact photo-eye Gallery at 505-988-5158 x121 or gallery@photoeye.com. Gorgeous, evocative work. Very evident that it's about more than just apples--there is a certain life to the images that can only breathe from a visual approach of something more than simple photodocumentation. Stunning!